Archbishop Diarmuid Martin | Is The Pope a Catholic? • Archbishop Martin: more on what renewal of the Church in Ireland might mean. 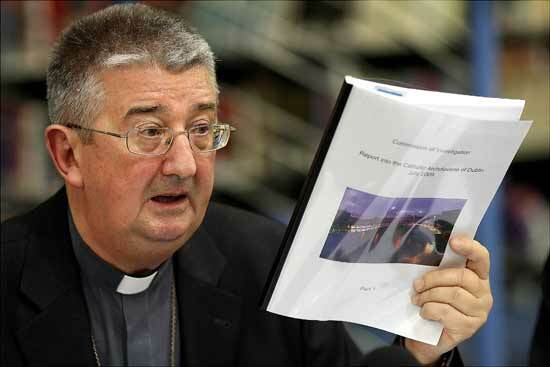 It is always worth reading the text of any of Archbishop Diarmuid Martin’s talks. In spite of huge focus on the “strong forces” (which quickly became “dark forces”) phrase in his talk to the Knights of Columbanus, there was a huge amount to reflect on – and to act on in that talk. Likewise in his recent address in the UK to the Oxford Newman Society. The lecture gives us more insight into the Archbishop’s approach to the whole abuse scandal. It also gives more insights into how the much spoken of renewal might take place. In particular I feel he really hits the nail on the head in his analysis of the roots of the crisis of faith in the Church here in Ireland. A form of religious education which is separated from the parish or some other non-school faith community will almost inevitably cave in the day that school ends. Sacramental formation belongs within the Christian community which welcomes and supports each of us on our journey. We need a more demanding catechesis, within a parish framework, for those who wish to come forward for admission to the sacraments. but how are they to call on one in whom they have not believed? And how are they to believe in one of whom they have never heard? And how are they to hear without someone to proclaim him? Take a few minutes to read the whole text – it’ll only take you about 10 minutes. 4 June 2010 | Address of Archbishop Diarmuid Martin to the to Oxford University Newman Society. I will be commenting in more detail on the quite long talk given by Archbishop Martin last night. He covered a lot of issues and made some really excellent points that are rarely made. I’m making this short post now to strongly urge you to read the full talk – there is a lot more to what he said than the short and dramatic sounding extracts we’ve been hearing today.